Today’s guest on CSReview – Domenico Italo Composto-Hart, a science fiction writer, author of Dark Legacy and professor of American, modern European and world history, geography, and economics in Barcelona, Spain. Stein: Dark Legacy, being a merger of science fiction and fantasy genres, has a very tangible ornament of the Orient, so mysterious and fantastic, in the names of the characters, their life style, and their culture. What inspired this? Composto: My fascination with Asian culture, which began when I was in junior high school. This was in the late 1980s into the early 1990s and at that time there seemed to be a sense of awe, and perhaps fear, amongst most Americans toward the strength of the Japanese economy. The U.S. economy was in a slump, so in seeking answers as to how to rise out of this recession and meet the challenges of the coming global economy there were reports, articles, books, and films (such as Black Rain and Michael Crichton’s Rising Sun), which displayed aspects of Japanese corporate and yakuza culture with an underlining tone of tension and competition in regards to which was better, the American work ethic and culture or the Japanese work ethic and culture? The answer–it seemed–was the Japanese work ethic, and with that answer came the media inquiries into the unique culture that gave rise to that work ethic. I remember clearly going to see a presentation by an actor/history teacher while I was in high school. This presenter originally led us to believe that although he looked Caucasian he was in fact Japanese; he portrayed himself–convincingly–as a descendent of Dutch traders who had settled in Japan centuries ago. He had a slide show clearly showing us, from a cultural point of view, how the Japanese saw Americans, essentially as backwards. He displayed an image of a European woman taking a bath and said, “Here we see a woman taking a bath in her own filth! 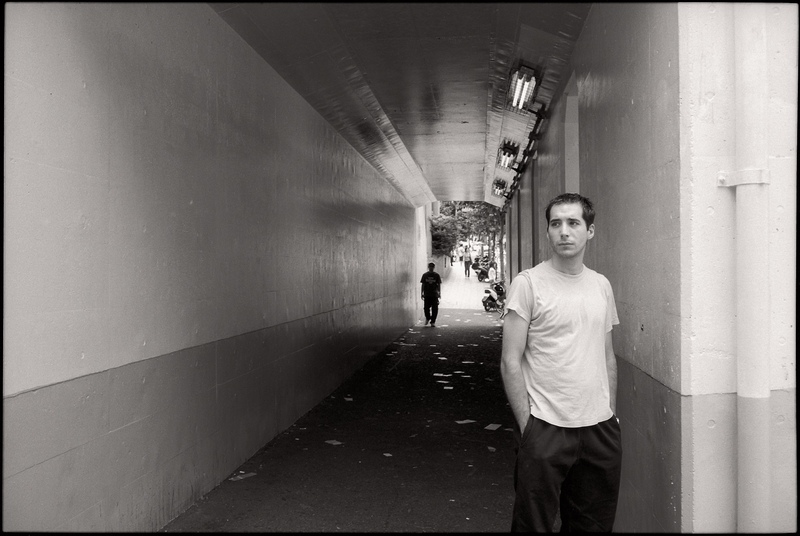 In Japan we take a shower before stepping into the bath to rid ourselves of all impurities.” When we heard that, I remember feeling offended–it felt like he was saying that we were barbarians–but at the same time I realized that there was a logic and truth in that point of view. It was soon after that presentation that I decided–and knew–that I would one day live in Japan for a period of time. 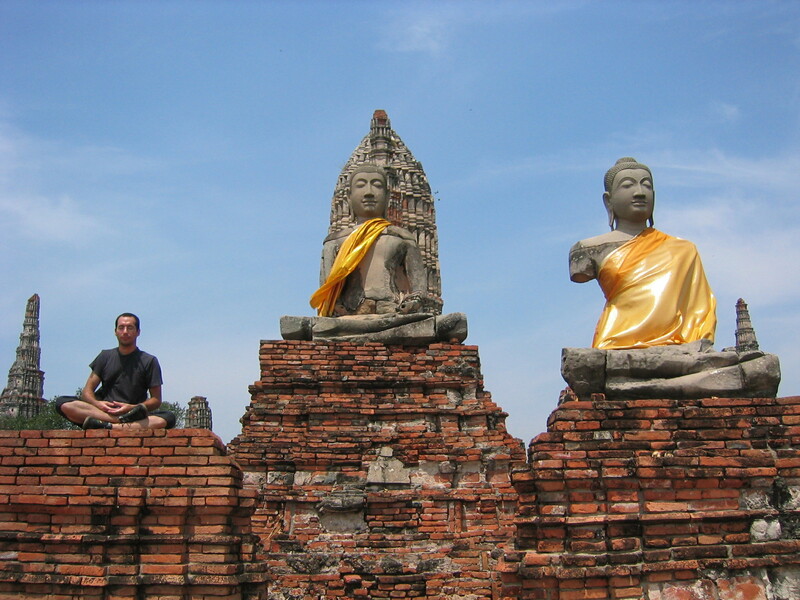 In the years that followed I read as much as I could to understand the Japanese culture to the point that I eventually lived in a Zen Buddhist temple and went off to live in Japan for three-and-a-half years. So that entire obsession and series of experiences all fed into the Dark Legacy novel. That is what I hope makes the book unique within the science fiction and fantasy genre since most novels within that genre draw upon Western mythology and culture. Dark Legacy draws almost entirely from Eastern mythology and culture, and although the depictions of Atlantis and the city-galaxy of Atlas appear more Western influenced, there is still a taste of the Asian since I drew upon my experiences from the megalopolis of Tokyo to serve as a type of model for Atlas. Most of Dark Legacy was written while I was living in Japan. Naturally, I drew a lot from the people, culture, and traditional lifestyle of that country. One aspect of the story–the second act where Master Shinsei is teaching and training Kieko within the Kadek Temple–was drawn, in some part, from the time I spent living in a Zen Buddhist temple. Stein: Amazing, Domenico. I too am drawn to the Japanese culture, having worked with the Japanese years ago, and now I have this obsession with haiku… I totally understand how the Japanese culture can provide the fertile soil for fascinating images, stories, characters. Speaking of which, is it hard for you to envision the development of your stories, growth of your characters? Is it hard to write a trilogy? Composto: A quick answer to that question is no. But to back up, Dark Legacy will be a six-book series. Many people naturally assume that it will be a trilogy since so many fantasy novels are trilogies, but the Dark Legacy series will be six books, with more to come after that in a second series entitled, Legacy of Light. Hopefully, I live long enough to finish it! In regards to writing a series of books and maintaining a vision for the development of each story and the growth of the protagonist, that was the part I found to be the easiest. There is a classical piece of music called Adagio for Strings, which was used in Oliver Stone’s film Platoon. It is a haunting piece of music and one I found myself continually attracted to when I was an adolescent. Every time I heard that piece I had a particular vision–a scene–in my head. That particular scene is the final end of the Dark Legacy series. So from there I worked backwards thinking what was the story of the character I saw in that scene. Who was he, where did he come from, what was his childhood like? I developed a back-story for this character and eventually sat down to write a one hundred plus paged outline of this character’s life to lead up to this one scene in my head. From that outline I took the first twenty to thirty pages and wrote, Dark Legacy: Book I – Trinity. I still have these outlines and over the summer, last year, I pulled it out and found that the beginning I had in mind for Dark Legacy: Book II – Travels has not changed although the story, details, and context of the story will be different from the original outlines. But the outlines are definitely a general guide (a sketch) that is clear in terms of where each story is leading to and how all six books will work as a whole. With that “sketch” I can fill in the details with all the new experiences and knowledge gained since writing the outlines. Stein: Sounds like a monumental undertaking! Do you always know what will happen to your characters? Have you been taken by surprise by any of them? Composto: That is a great question. No, I don’t always know what will happen with my characters in terms of the individual choices that they will make. In regards to the ultimate outcome for most, if not all, of the characters from Dark Legacy: Book I – Trinity I had a very clear idea of what would eventually–inevitably–happen to them, but in regards to their individual choices throughout the story I did not. Their choices became apparent within the writing process, but there were many times that I would have to back up and correct or alter certain choices as a result of sharing drafts of the story with my editor, Thomas Lee, and with friends and family. Their feedback was a critical aspect of helping me see through their eyes, the eyes of the reader. Sometimes as a writer you write and assume that the reader will pick up or quickly understand certain aspects of the story or the characters. Since you are so intimately involved and see the road ahead of where the story is going you may lose sight of what is obvious and not so obvious to the outside reader. I remember working with my editor in developing the character of Kira and her relationship with her mother, father, and with Kieko. To really develop her character to my editor’s satisfaction, and my satisfaction once I could see through his eyes why the character needed work, I had to go back and write and rewrite again and again. That experience of working alongside my editor and going over essentially the first act of the story, paragraph by paragraph, is where I feel I became I true writer. He became my “ideal reader” and his critical analysis of the story and the characters really developed and strengthened my writing abilities. I always have him in mind when I write; I can hear him saying in my head, “Show, don’t tell,” or “That is lazy writing, fill in the holes,” etc. Stein: This only proves that practice makes perfect – your hard work surely shows in the book. Is there a part of you in Dark Legacy? If yes, who are you in the book, where are you? Composto: Yes, there are many aspects of my personality, experiences, and past in Dark Legacy. Authors, writers, filmmakers, artists, musicians, and all those involved in the creative arts probably have this secret understanding that their works, and the works of others, are really reflections of ideals, values, concerns, and experiences that they hold dear to their heart. When you read a book from an author or watch a film or observe a work of art you are really looking deep into the soul of the individual who created it. They are speaking to you, revealing an intimate part of their very being with you. Just recently I saw the film Super 8 with my wife. After watching the film we saw the behind-the-scene interviews available on the DVD with the director, J. J. Abrams, and producer, Steven Spielberg. They discussed how they came up with the idea for the story for Super 8 and essentially it was the story of their childhood, their adolescent years, and how they would run around making short movies on 8 millimeter film (in Stephen Spielberg’s case) or with their Super 8 camera (in J. J. Abram’s case). It was so enjoyable to see them discussing their childhood and reveal that the film Super 8 was essentially revealing aspects of their own childhood. I loved that! In regards to who am I in the book? Many aspects of Kieko’s experiences, frustrations, and journey are in some way autobiographical of my years as an adolescent. My search to understand what it means to be a man, to have integrity, to do what is right, dealing with bullies, feeling different, curiosity and love for women, dealing with my own personal anger and teenaged angst, wanting to change the world and ensure justice while feeling unable to do so, and seeking mentors to show me the way. There are little aspects of my past in most of the characters in regards to drawing upon people throughout my life to define the characters that the protagonist interacts with. Stein: Interesting that you should mention Super 8. The movie has been reviewed on CSReview by a guest poster Michael Panush. I remember thinking when reading his review that childhood truly never ends – it just takes on a different form later on as we mature. Where do you see yourself as a professional writer in five years from now? Composto: That is a difficult question. I don’t usually like to project a vision of myself into the future. When I turned twenty (or around that time) I promised myself that I would finish and publish my first book when I turned thirty. 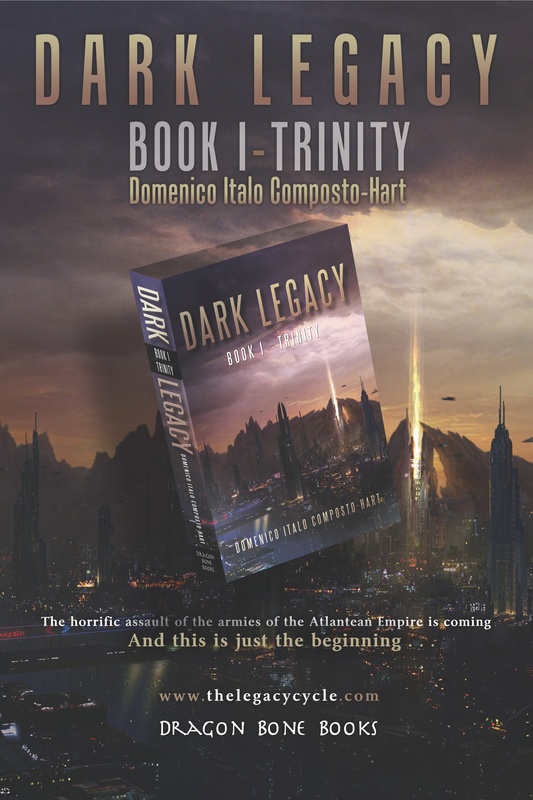 About six weeks before I turned thirty I was nearly finished with the first complete, final draft of Dark Legacy: Book I – Trinity, but while in a café in Barcelona my backpack, which had my laptop, was stolen. It was a fairly new laptop and I foolishly hadn’t saved a backup copy of my book. As a result, about six months worth of work was lost on the book; I was devastated to say the least. 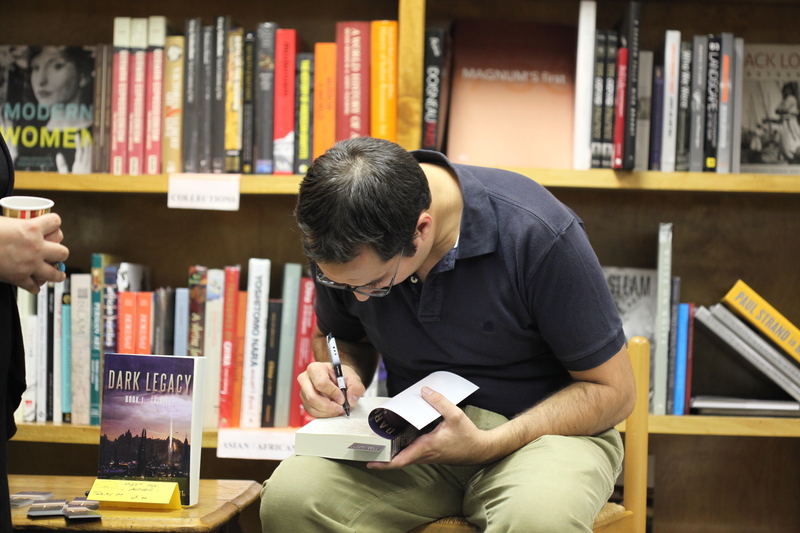 Finally, when I was thirty-three, nearly thirty-four, I finished and published Dark Legacy. With that experience I learned that it is good to have goals set in the future, but to simply take things as they come and to not loose heart when the objectives I have set in the future do not come to pass exactly as I would like them to. Whether this happens in five years from now or not, ultimately I would like to make a living as a professional writer and author working on the completion of The Legacy Cycle sci-fi/fantasy series of books while also writing books within the genre of steampunk and science fiction. If that comes to pass then with it comes the freedom to take my family to live in a few exotic places to further inspire my writing. I would like to take my family to live for half a year, to a year, or more in Hong Kong, Shanghai, Tokyo, Sydney, and perhaps London. My home is here in Barcelona, but my wife and I met while we were backpacking throughout Southeast Asia, so it is a dream of ours to take our son to experience and live in the cities in Asia that inspired us. Stein: Domenico, thank you very much for being here and sharing with us the behind-the-scenes story of Dark Legacy. Wishing you good luck with your future projects and traveling around the world again!